A plain located at great depths on the floor of the ocean is called an abyssal plain. An outwash plain in Iceland. In geography, a plain refers to a flat area with little or no changes in elevation. It is one of the world’s major landforms. Plains are usually found at the foot of mountains, by the coasts, at valley bottoms, or on the upper surface of plateaus. Plains are often the most densely inhabited places in the world. The relative ease of transport along level land favors human settlement. Plains in many parts of the world are important for agriculture. Interestingly, plains also occur underwater where they constitute part of the seafloor. Such plains are called abyssal plains. In this article, we take a look at the different types of plains and their mechanism of formation. Also called a sandur, an outwash plain is formed by glaciers. Such a plain is formed when a glacier deposits sediments at its terminus. As a glacier moves, it erodes the bedrock and carries the eroded sediments downstream. These sediments are deposited by the meltwater of the glacier at the snout. Outwash plains are a common landform in Iceland. 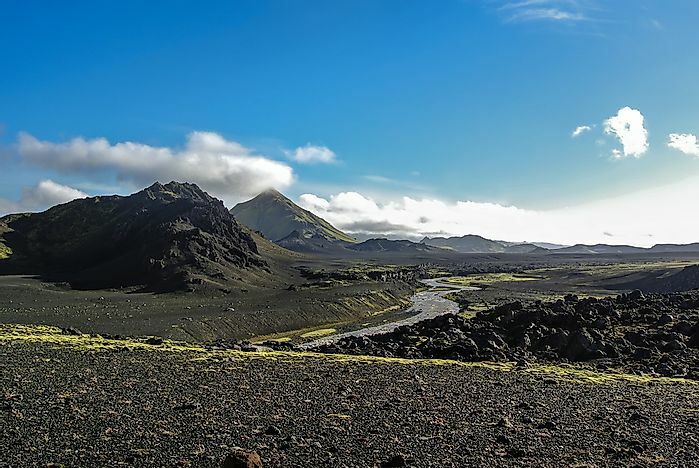 The Skeiðarársandur in Iceland is the world’s largest outwash plain with an area of 1,300 square km. A till plain is also a plain formed by glacial action. Such plains are formed by the deposition of glacial till (unsorted glacial sediment). When a sheet of glacial ice gets detached from the main glacier and melts in place, the sediments are deposited on the ground to result in the formation of a till plain. Such plains can be seen in northern Ohio where they were created by the Wisconsin glaciation. A lava field can also be referred to as a lava plain. Such a plain is formed by the accumulation of layers of lava. The lava plains can stretch for miles and are easily visible from the air or in satellite images where they appear darker in color than the surrounding landscape. Lacustrine plains are formed in areas previously occupied by lakes. When a lake drains out completely due to factors like evaporation, natural drainage, etc., the sediments remain behind on the lakebed to form a plain. Such lacustrine plains might be highly fertile and support agriculture or might form a wetland or even a desert depending on the composition of the sediments. Lacustrine plains are common in Southern Indiana of the US where such plains are found in areas formerly occupied by proglacial lakes. The Kashmir Valley of India is also an example of a lacustrine plain. Scroll plains are formed in areas where a river meanders across a low gradient. Deposition of sediments at such locations results in the formation of a plain. Oxbow lakes are common occurrences in such areas. The Taieri River forms a spectacular scroll plain near Paerau in New Zealand. A floodplain refers to a plain that stretches from the banks of a river or stream to the enclosing valley walls. Floodplains are usually subjected to flooding when the adjacent water body overflows. The plains are often fertile and are made of deposits of silts, sands, levees, etc., deposited by floodwaters. Floodplains usually support a rich ecosystem. Many densely populated cities are located on these plains. However, many of the most devastating floods in history have taken place in floodplains. The Yellow River's floodplains is one such area that is frequently subjected to deadly floods. Alluvial plains are vast, sweeping stretches of plain land that are formed by the deposition of sediments called alluvium. An alluvial plain usually includes floodplains as part of its area but extends beyond such plains. An alluvial plain represents the pattern of floodplain shift over geological time. As a river flows down mountains or hills, it carries sediments resulting from erosion and transports the sediments to the lower plain. As the sediments build up over time, the elevation of the floodplain increases while the width of the river channel decreases. Unable to bear the pressure, the river now looks for an alternative course with a higher channel capacity. Thus, the river forms a meander and flows through a new channel. In this way, floodplains continue growing and adding up to form massive stretches of alluvial plains. The Indo-Gangetic Plain in India and the Po Valley in Italy are examples of alluvial plains. A plain located at great depths on the floor of the ocean is called an abyssal plain. Such plains can be found at depths ranging between 9,800 ft and 20,000 ft. Abyssal plains comprise about 50% of the surface of our planet. These regions are some of the world’s least explored areas as well as the flattest and smoothest ones. The abyssal plains are massive in size. For example, the Sohm Plain of the North Atlantic Ocean covers an area of about 900,000 square km. Such plains are most common in the Atlantic Ocean but quite rare in the Pacific Ocean. Such plains are considered to be formed by the deposition of sediments, derived from land, in the abyssal depressions. Such deposition occurs in many layers till the underlying irregular features are smoothened out to result in a flat plain.